A computer science degree from one of the world’s top higher education institutions can help graduates land their dreams job at companies like Apple, Google, Microsoft, Facebook, or Amazon. But if your goal is to impress prospective employers, which university should you shoot for? Using the QS World University Rankings 2018, we took a look at the universities with the top computer science and information systems courses. The QS University Rankings guide is one of the most reputable sources that students turn to when deciding which universities to apply to, and employers are also likely to refer to it when deciding which candidates to hire. It is based on academic reputation, employer reputation, and research impact. The full methodology can be read here. CUHK is a relatively young university, but it has improved steadily over the years. One of Russia’s oldest institutions, which also ranks high in overall rankings. Founded in 1896, the Chinese university Shanghai Jiao Tong University is one of the most prestigious universities in China. USC is a world-class research university, and the oldest private-research university in the West. UoM is the state’s oldest university, and is now considered one of the foremost research institutions in the country. UCSD is one of the top 20 universities in the US. The campus is decorated by over a dozen public art projects, providing the university with a distinctive look unlike other institutions in the state of California. With approximately 40,000 students, Politecnico di Milano is the Italian largest university for engineering, architecture, and industrial design, and it is ranked as one of the most outstanding European universities in these fields. NTU was founded in 1928 during Japanese rule as one of the Imperial Universities, the Taihoku Imperial University. After World War II, Taiwan’s government resumed the administration of the University, reorganizing and renaming it National Taiwan University on November 15, 1945. TUM has 14 academic departments and 40,124 students, of which around 24% are international. It calls itself The Entrepreneurial University and aims to foster a supportive environment for budding entrepreneurs. UNSW Sydney is one of the world’s leading research and teaching universities. Established in 1949, it’s home to more than 52,000 students from over 130 countries. Seoul National University is widely considered to be the most prestigious university in South Korea. Rated the maximum 5 QS stars, Yale University achieved full marks in research, innovation, internationalization and specialist criteria. Founded in 1740, the University of Pennsylvania is an institution with a long-standing reputation. It also achieved the maximum 5 QS Stars from the latest QS World University Rankings. ANU is a world-leading centre for education and research. Ranked #1 in Australia and #20 in the world (QS World University Rankings 2018), Australia’s national university is further distinguished by an outstanding record for student satisfaction and graduate employability. The University of Sydney’s community – which covers the world – includes more than 50,000 students, 3,400 academic staff, and 320,000 alumni. Ranked as the 51st best university in the world in the QS World University Rankings 2018, the University of British Columbia has an excellent reputation with academics and employers alike. According to the QS World University Rankings by Subject, KAIST is particularly strong in a number of STEM subjects, such as materials science, engineering and technology, chemistry, and engineering. New York University (NYU) was rated the maximum five QS stars, achieving full marks in the categories research, innovation, facilities, and specialist criteria. A world-leader in research, with outstanding results in the latest Research Excellence Framework (REF) 2014, UCL is home to centres of teaching excellence in subjects including medicine, languages, law, engineering, history, and astrophysics. The University of Waterloo has been ranked Canada’s most innovative university for the past 25 years. More than 16,000 undergraduates participate in the world’s largest post-secondary co-operative education program where students alternate school and work terms, gaining experience with employers such as Google, Facebook, and Amazon. The university also ranks among the top 50 universities in the world for linguistics, computer science and information systems, civil and structural engineering, electrical and electronic engineering, mechanical engineering, agriculture and forestry, psychology, chemistry, environmental studies, materials science, physics and astronomy, and other fields. The University of Edinburgh is one of the world’s top universities, consistently ranked in the world top 50, and ranked 23rd in the QS World University Rankings. The University of Texas at Austin ranks 67th in the QS World University Rankings 2018. It also ranks among the top 80 universities in the world for employability in the QS Graduate Employability Rankings 2017. Rated the maximum 5 QS stars, Cornell University is ranked 16th in the QS World University Rankings 2016-2017 and 14th in the Graduate Employability Rankings 2018. With the maximum 5 QS Stars and being the 18th best university in the world according to the 2018 QS World University Rankings, Columbia University is one of the world’s most important academic institutions in the world. Established in 1877, the University of Tokyo has ranked the 28th best university in the world in the QS World University Rankings 2018. Home to 10 facilities, spread across five campuses, the university is particularly well-regarded for a wide range of subjects. Based in sunny Pasadena, California, California Institute of Technology (Caltech) is the fourth best university in the world according to the QS World University Rankings 2018. It was rated the maximum 5 QS stars and is top of the class in research, innovation, facilities, and specialist criteria. Ranked 70th in the world in the QS World University Rankings 2018, Georgia Institute of Technology is a science and technology research university based in Atlanta, Georgia. It also ranks among the top 20 universities in the world for several subjects. Founded in 1911, Tsinghua University is known for fostering talent and scientific research, with 149 key research institutes, including 13 state key laboratories. The University of Washington (UW) is one of the world’s preeminent public universities, which educates more than 54,000 students annually. Ecole Polytechnique Fédérale de Lausanne ranks 12th globally according to the latest QS World University Rankings and is a top-ranked institution. The university is located in Lausanne, Switzerland, and was founded in 1853. The institution is well known for focusing on physical sciences and engineering. Peking University is one of the largest and most prestigious research universities in China and a member of the C9 League, the Chinese equivalent to the Ivy League. Approximately 2,000 international students are based at the university each year. Nanyang Technological University is an autonomous institution based in Singapore. It has been ranked the best university in the world under fifty years of age, according to QS Top 50 Under 50 2016-2017, and is also 11th in the world in the QS World University Rankings 2018. The University of Melbourne is ranked among the leading universities in the world, being in the top 50 best universities in the world, according to the QS World University Rankings 2018. The university offers both undergraduate and postgraduate programs in more than 80 different study areas. Established in 1991, the Hong Kong University of Science and Technology (HKUST) is an international research university dedicated to top-notch education and research. Founded on its mission to advance learning and knowledge through teaching and research particularly in science, technology, engineering, management, and business studies. Based in warm and sunny Los Angeles, the University of California, Los Angeles (UCLA) was ranked the 33st best university in the world according to the QS World University Rankings 2018. Ranked 8th in the world in the QS World University Rankings 2018, Imperial College London is a one-of-a-kind institution in the UK, focusing solely on science, engineering, medicine, and business. Ranked 31st in the world in the QS World University Rankings 2018, the University of Toronto excels in geography, nursing, sports-related subjects, anatomy, and physiology, according to the QS World University Rankings by Subject. ETH Zurich’s 500 professors and 20,000 students come from than 120 countries. The institution’s track record of scientific excellence includes 21 Nobel laureates, among them Albert Einstein. It’s consistently the highest-ranked university in continental Europe (based on the QS World University Rankings). Princeton University is an institution with an impressive reputation and one of the oldest universities in the United States. Princeton University is the 13th best university in the world according to the latest QS World University Ranking and was rated 5+ QS Stars. The UK-based University of Oxford was rated 5 QS stars, achieving top marks in research, teaching, and innovation. The sixth best university in the world according to the QS World University Rankings 2018, the University of Oxford is also eight in the world for employability. Harvard University is America’s oldest institution of higher education and the third best university in the world according to the latest QS World University Rankings. The University of Cambridge has achieved the maximum five QS stars in four categories: research, innovation, teaching and specialist criteria. 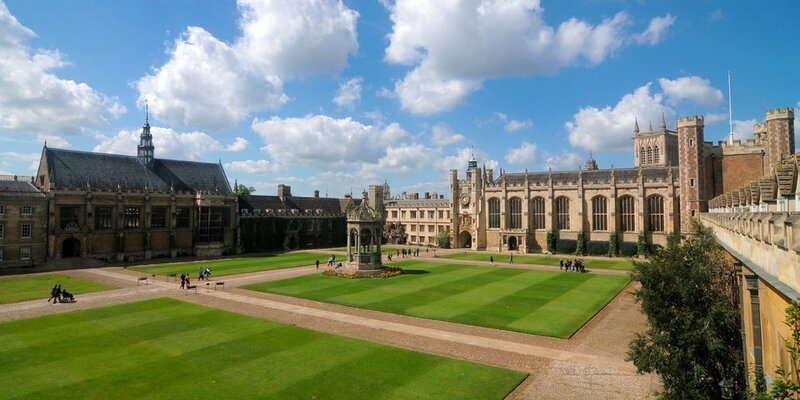 In addition to being the fifth-best university in the world (as well as the first non-US institution) according to QS’ data, the University of Cambridge is fifth in the graduate employment rankings. The University of California, Berkeley is one of the world’s leading academic institutions. Widely known as “Cal,” the campus is renowned for the size and quality of its libraries and laboratories, the scope of its research and publications, and the distinction of its faculty and students. Based in Silicon Valley in California, tucked away between the green rolling hills of San Jose and the heights of San Francisco, Stanford University’s manicured lawn has been trodden on by some of the world’s brightest researchers, tech entrepreneurs and influencers of our generation, including Elon Musk, Sergei Brin, Peter Thiel, John Kennedy, and Larry Page. Founded in 1861, Massachusetts Institute of Technology (MIT) is the best university in the world according to the QS World University Rankings 2018, a title it has regularly claimed over the last few years. Rated 5+ QS stars, it’s achieved the maximum score across all categories, including research, employability, teaching, facilities, internationalization, innovation, specialist criteria and inclusiveness.